This is the latest painting I've done with the still life group that meets on Tuesday evenings at Michelle Walker's studio. I got a late start on this one due to the fact that I attended my grandson's baseball game before. Ryan is 8 years old and is a great baseball player - at least from Grandma's viewpoint - and one thing is certain...he is the cutest, best-looking 8 year old on the diamond!!! Michelle set up this still life with white porcelain pears and a gold plein-air frame. Unfortunately my granddaughter says she likes my purple pears, so I guess I went a little overboard with the purple for the shadows. This painting is done in oil and is painted on an 8"x10" canvas panel which was underpainted in black gesso. 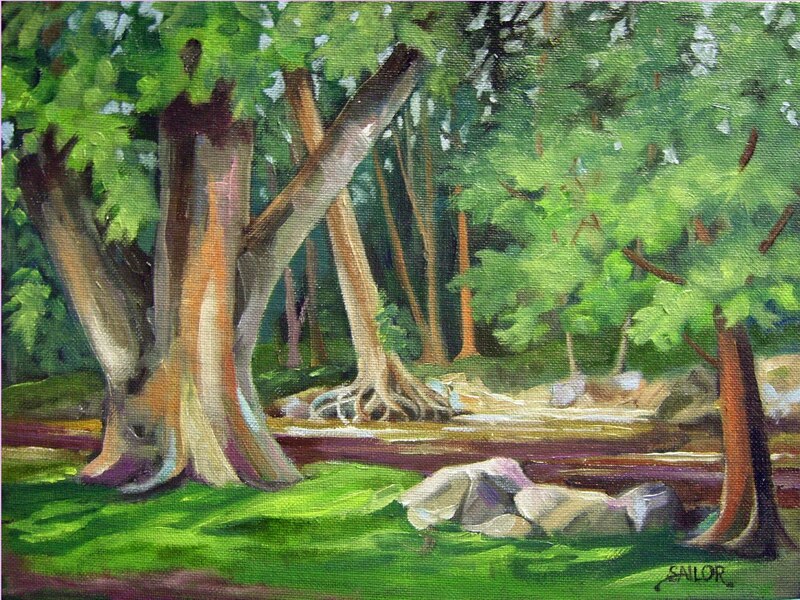 This was my third painting in Chris Leeper's plein air workshop in Wapakoneta, Ohio. This painting is 9" x 12" and is painted on a prepared panel. This is the second painting created in the Chris Leeper Plein Air Workshop in Wapakoneta, Ohio. This is also a scene along the Auglaize River. It is painted on an 8"x8" canvas panel in oils. This is the first oil painting I did in the workshop with Chris Leeper. It is a scene along the Auglaize River near Wapakoneta, Ohio. The painting is 9" x 12" and is painted on a canvas panel. Tonight I finished this plein air painting that I started last Friday while plein air painting with Michelle Walker and Chris Leeper at Provico in Botkins, Ohio. It was a misty, cold, rainy day and I tried to capture that feeling in this painting. The painting is 9" x 12" and is painted on a canvas panel. It was such a privilige painting with Chris Leeper. This is todays daily creation - a small oil painting 6" x 6" painted on a canvas panel. Michelle brought the ceramic rabbit and the material to our painting group today and I provided the old enamel pitcher. What fun!